Meet our students . . .
Susan was invited to Milwaukee June 30-July1, 2018 to train Milwaukee bike enthusiasts in her technique for teaching bike riding. Here is the beginning of the class. Oliver was the youngest student. The bikes were brought to the training ground by cargo bike. We want to thank you for your time and patience on such a warm day. Oliver is so excited to know how to ride and he is the envy of all his friends. On Sunday we went out and perfected riding on his own. He’s still getting the hang of starting on his own, but he is doing great! Thanks again! You were a blessing! We'd been trying to teach our seven year old to ride his bike for two years, with no luck. A friend told me about the Bicycle Riding School and the April break camp fit our schedule perfectly. Susan really does have the magic touch, because in just two days she had my son pedaling around the parking lot! He gained the skills and confidence to finally take off on his own. He's even planning to do the Kid's Pan Mass Challenge this year. We are so excited that we can finally ride bikes as a family. 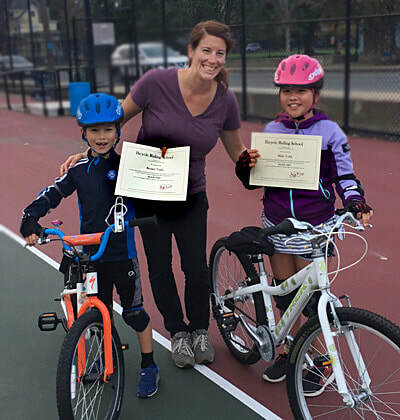 We HIGHLY recommend Susan and the Bicycle Riding School! My experience was extremely positive. The fact that last day of four lessons training, I was able to bike for almost 4.5 miles, was just stunning for me. I had not expected that. Jenny is an amazing instructor, she kept her eyes on us throughout. She picked up on our areas of strengths and struggles. And offered more time to work on our shortcomings, in addition promoting our strengths. I didn't think I could ride on busy bike path and on chilly days. I am hoping to return to either Jenny or you for some solidification of skills. Once again thank you for offering such a wonderful service. Thank you again! You’ve changed my life! These classes have been the highlight of my year! It was nice to meet all my classmates! A million thanks to you for teaching me what I consider to be one of the biggest lessons in life. Being able to get on a bike and just ride is truly a huge accomplishment for me. When I started the lesson, I doubted I would be able to keep my balance on a bike but I/we did it! I can't express how deeply grateful I am, but I hope you know it is very much appreciated. I have been showing off my certificate and while some laugh because no one ever expects to see a diploma in biking, it's one of my proudest accomplishments and a reminder to me that I can do anything I set out to accomplish with God's help, of course, and with great teachers like yourself. So, once again, many many thanks! You are a magician! You know how to teach everyone to ride a bike. You taught me in such a short time, after decades of fear. Thank you, I cannot express my gratitude enough. You are an exceptional teacher, so humble, always smiling, very positive, and encouraging all the time. I wish you good health and to continue to teach people and bring smiles to many as you did with me. Thank you! We are extremely grateful to you for teaching us how to ride a bicycle. Your wonderful instructions on the proper techniques made learning so much fun and I can honestly say, helped me learn much quicker than I had hoped for. Learning how to bike has clearly changed our life and how we spend our free time. Hopefully, winter will come a little later this year and we can keep biking into December. We look forward to keeping in touch and being part of the alumni rides in the future. I took those lessons in June 2013, and just realized I never wrote a testimonial for someone as AMAZING as Susan, and so I decided to finally get to it now. Better late than never. It's now 2018 and I bike very often. I have a membership with Hubway (since I don't have place to store a bike at my apartment) and it works out super for me. I ride confidently on roads all across New England in traffic, with no fear. It's a breeze and one of the best things I did for myself. All thanks to Susan and her amazing Bicycle Riding School! Do yourself a favor (no matter what age you are) and take lessons with Susan if you want to ride a bike. Such joy! Thank you, Susan! You're the best! Ever Grateful! Thank you for the gift that keeps on giving. It was the calm encouragement of your skilled instruction that created a life long enjoyment of riding a bike. You truly are the bicycle whisperer. On one of our first dates, my wife and I bonded over the discovery that we shared the same dark secret: neither of us had ever learned to ride a bicycle. And when you don't learn as a kid, there never seems to be a right time to learn as an adult... Until twelve years later, we had become the parents of a kid who wanted nothing more for his 5th birthday than a bike -- the one present we couldn't really give him safely without knowing how to bike ourselves. Instead, we found Susan online and got the whole family bike lessons. Susan has an incredibly patient and positive approach (except for scolding Ben's bike when it didn't behave, which cracked him up). By the end of the first lesson we were all balancing down the slope, and by the third lesson we were pedaling in circles together! It was really cool for Ben to see his parents struggle and then succeed, and for us all to cheer each other on. And best of all we all had fun -- my wife was the least certain about whether she'd be able to do it, but had ordered her own helmet after the 2nd lesson and was reading bike shop reviews after the 3rd. We feel like we've been given a gift, and look forward to biking around the paths near our house together for years to come. We have a family of avid bikers, but somehow Alex never got the knack. When Alex got too big to ride on the tag-along, we tried to teach him--and failed, miserably, for years. However, after one lesson with Susan, Alex was actually pedaling himself. After three lessons, he was comfortable enough to try biking near our house. This photo was taken a few weeks after his last lesson, when Alex confidently and enthusiastically biked about 5 miles, on bike paths, streets, and sidewalks. Now he can (finally!) bike with his older brothers and parents. 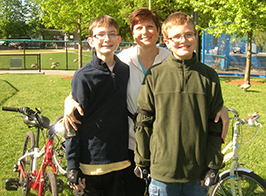 Thank you, Susan, for allowing our family to bike together again! It was a spring day in 2016, I woke up and went for a walk on Minutemen trail in Arlington, MA. The birds chirping, the tender green leaves sprouting on the bushes and trees clearly reflected that the winter was becoming the past. I saw lots of people walking, jogging and a few bikers. I was particularly interested in the bikers and wondered if I could get back to biking, which I did 50 years ago! I knew I could do it, but didn’t dare to do it now. I talked to my daughter. 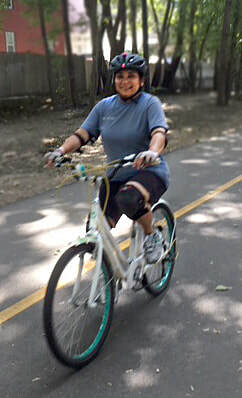 She, her friends and I went bike riding, but I was on the tandem bike sitting at the back, with my daughter in the front! We had one helmet and guess who used it? Me,t at the back. I pretended to bike. It was an exhilarating experience and I frantically wanted to resume my biking skills. I googled and came across the Bicycle Riding School, in Somerville, just two miles away from my home! Hurray! That was God’s response to my dream!! I jumped on it, though I didn’t have high hopes, because I was not confident. On the other hand, Susan, on the other side of the phone, was very enthusiastic and encouraged me to meet with her the following week. My first class was in a school parking lot. Susan wanted to see where I stood with biking. She was highly motivating and very supportive. Then we had a few more classes to build confidence, to learn the tricks. After that, I was out of the country for nearly eight months. When I returned, it was winter and the next spring, I was scared to bike again, so I called Susan! Ever ready Susan scheduled an appointment for the bike class, this time with David. He was awesome! Learned more tricks, rules, cycle maintenance, etc from him. I also rode with instructor Pata once. She is an expert in teaching to ride on the streets. Being new to Massachusetts, I tried once and chose not to do it for some time. Coming from California, I was not confident to ride on narrow streets. But in two years, I’m excited and enthralled to ride my bike on Minutemen trails. Feels like a 15 year old with old memories of riding the bike, extremely happy and thankful that Susan brings back the child in me. I was so thrilled that I posted my biking pictures in Facebook and my entire family of two generations and friends cheered me. Now I’m in the ‘Alumni association’, where the graduates of the bike riding school go together on ‘Alumni bike rides’ on the trail led by Jenny. This has given me tremendous confidence to ride with bikers, walkers, joggers, runners and strollers, which I dreaded earlier. 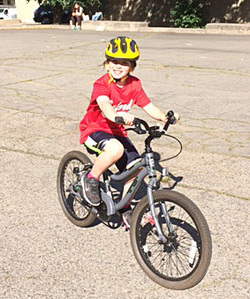 So incredibly grateful to the Bicycle Riding School for helping Jack to get on his way to finally riding a bike independently! My son was close to 9 years old when we decided to go to Bicycle Riding School. I thought he'd never learn to ride a bike. 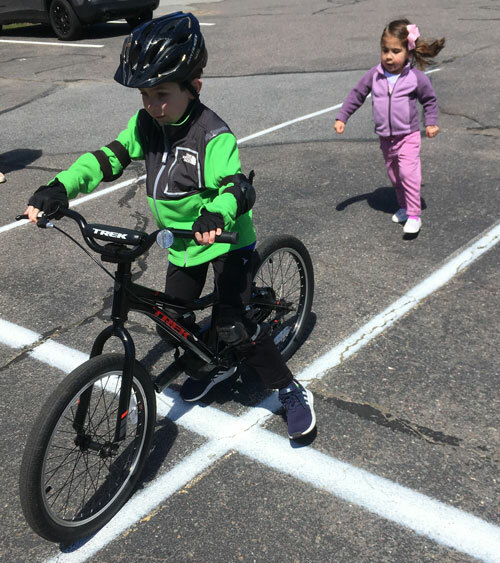 Jenny takes a step by step approach to teaching kids to ride a bike, and by the end of the first day, he learned to ride, and now, his favorite thing to do is zip around the neighborhood doing tricks on his bike. This was the best thing I did all summer and I am grateful to Jenny for teaching him to ride a bike! It has been a real pleasure having you as our teacher. You made it so easy and natural that we did't even realize that we were learning, because we were always having fun. You took care of us every moment and gave us the confidence to start riding on our own from now on. I would also like to thank you for such an amazing graduation ceremony, and for the information you gave us...this very weekend we will buy our bikes!!! I wish you guys the best of luck, including you Susan, and thank you for making us room this week at such a short notice. Thank you for your patience and your encouragement words all the time. The experience has been wonderful!! My family and I drove up from NJ to Somerville on a Friday morning. My daughter and I had a class scheduled with Pata. By the second lesson, we were riding on our bikes!!! How did it happen...our ‘bicycle magician’ with the magic wrench wand (yeah that’s what we call Pata now) made it happen! My daughter calls it magic, but it’s the simple but correct techniques that Pata taught us that made it possible. She made us feel comfortable and relaxed and worked with us at our pace, knowing that my daughter’s pace was different than mine. I remember the moment I pedaled for 2 continuous minutes for the first time. I went over and hugged Pata! Now every time I ride my bike, I thank Pata (and Susan) a million times in my heart for the wonderful gift for a lifetime!! I would say this to all...if you want to learn to ride a bike, just get out there and give it a try. It’s never too late and it’s just too amazing once you learn to ride! The multi-generational class was a brilliant way to have a special mother-daughter time with my girl, and get to learn a life-skill together. Susan is a specially gifted teacher, she is knowledgeable, patient, and pays close attention to each student with encouraging and useful feedback. She generously shared big wonderful smiles that made my own anxiety disappear. And having a class of mothers and daughters was like having a biking support group! The classes are structured so that you get to develop your abilities and build up your confidence in stages. Susan designed her classes with small incremental challenges that gently and systematically moved both my individual biking skills, and our skills as a group, forward. Can't say anough good things about it. It was a wonderful experience! Thank you, Susan! - Efrat S.
Dear Susan, I always envied seeing others riding bikes. I convinced myself that, riding is not necessary for my lifestyle and I am not fit for it. I also learned to believe riding is not that fun. Then, thanks to google, I found your school and voila!! I was quite skeptical about my ability to ride a bike in only four classes. Who knew you can teach an old dog a new trick. Thanks to you, now here I am at 47, getting a bike for myself and enjoying the breeze. - Chaitali D.
The Bicycle Riding School is a perfect place for anyone wanting to learn to ride a bike. Susan McLucas is a wonderful, patient teacher. She gives you all the helpful hints and advice you need to ride safely and with confidence. The inter-generational classes are a must for parents who want to learn or re- learn with their children. 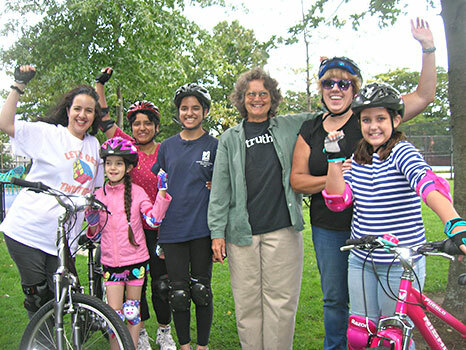 Kudos to Susan for starting such a unique, encouraging place for people of all ages to fulfill their dream of riding a bike. Sincerely, Laura M.
My Mom took me to the Bicycle Riding School because I wanted to learn to ride my bike. All the kids in my neighborhood knew how to ride except me. I was too afraid until I met Susan. She is really nice and I got it on the first day. Now, I'm not afraid anymore. In 5 classes, Jenny helped me achieve what I had deemed the impossible. I learned how to balance on the bike, trusting the pedals would find my feet just as the body committed to its memory the cumulative knowledge (the many trials and errors) on how to stay even. There is something about spurring the mind into mechanical kinetics, inscribing into sense and intuition which gear to use and when, and how to push the entire weight of the self down standing up on one pedal to gain both optimism and momentum. I was born in Boston and moved to Rio de Janeiro, Brazil before my first birthday. I came back many times to visit and this time for a special reason: learn how to ride a bike. One day after I graduated I went on a tour of Boston by bike and three days after, in Central Park! 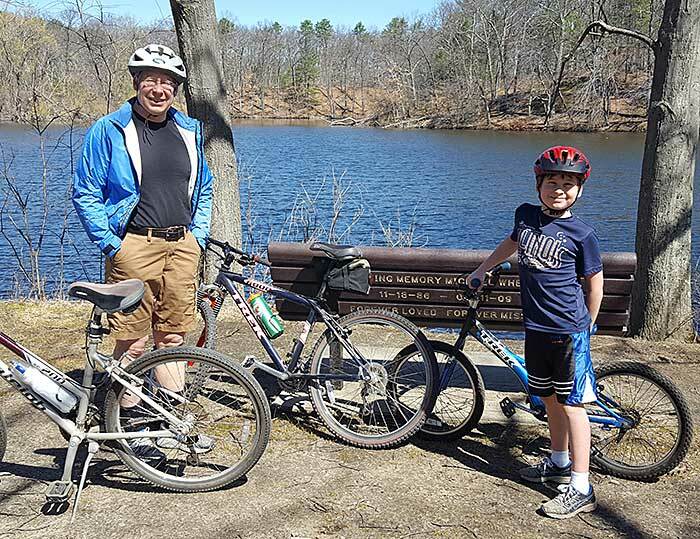 When we saw a friend’s posting on facebook that her son had just learned to ride a bike with the Bicycle Riding School this past summer, we immediately signed our son, Zachary (8) up that weekend! 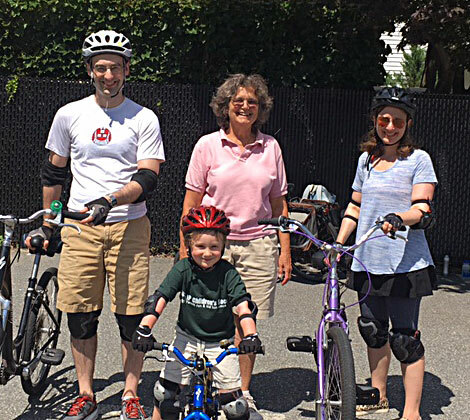 I am so impressed and grateful for our son’s instructors – Jenny (3 trainings) and Pata (1 training) with their patience, guidance, and calm, positive attitudes helped our son learn to ride a bike this summer. Their teaching styles made his learning experience a wonderful one! He has gained so much confidence in himself! 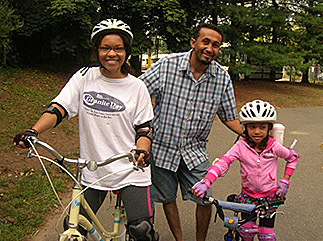 We cannot say enough wonderful things about the Bicycle Riding School! Thank you so very much!! Kind Regards, Dianna & Susan L.
I call you the woman of hope. It was my pleasure to be at your school and to meet a wonderful person like you. My children learned to ride bikes from Jenny. She is kind, patient, responsive and follows up on your visits. She taught my 8 and 6 year old at the same time and they adore her. Her training technique helped both of them learn quickly and they graduated! I have referred many friends to Jenny and will continue to do so. She has a flexible schedule and can work with you. For reasons now largely lost to family history and lore, I never learned to ride a bicycle as a child. Before Yaneer and I married and then again about 8 years ago, he started to teach me, but we didn't finish and I wasn't comfortable soloing on a bike. It's something I've always wanted to learn. For the last number of years I have thought about it every spring, but I was afraid falling would cause greater injury as I get older. This year, for some reason, I decided to try it, I was only going to be a year older next summer. 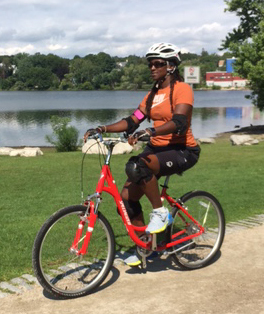 A month ago, I started a bike riding class for adults at the Bicycle Riding School in Somerville, MA. Six adults learned together to ride bikes. Susan McLucas, our wonderful, patient instructor suited us up with elbow and knee pads, and set our bike seats low so we could reach the ground easily. We started with balancing on a gentle slope with no pedals. For 4 Sunday mornings we progressed one step (or one wheel turn) at a time. 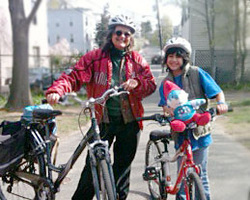 Yesterday was our last class, we took a bike trail from Somerville to Spy Pond in Arlington, about 5 miles round trip. The drizzle let up just as we arrived at Spy Pond for our pot luck celebratory snack. Each of us had a story about why we did not learn to ride a bike as a child, each of us pushed ourselves outside of our comfort zone, each of us stands just a little taller today than we did when we started. This was the most amazing class. My bike mates and I were very nervous at the start, but after 1 hour, we were all riding our bikes! What an exhilarating feeling and such a sense of accomplishment! I would highly recommend this class! Thank you for helping our daughter get over her fear of bike riding. We were amazed at how quickly you were able to get her balanced and moving forward. Your equipment and your advice were priceless. After her lesson, my daughter spent the entire weekend riding her bike. We would be happy to recommend you and your services to anyone who is having trouble getting on a bicycle. I just learned how to ride a Bike, thanks to Susan. I am excited. 'What's the big deal?' asks my 14 year old son. He does not understand how excited I am, as I ask him to accompany me to the local park to practice. I was 19 years old, a student at the University of Nairobi, Kenya, when a group of us decided to drive down to the coastal city of Mombasa for a week of vacation. The vacation activities included swimming, dancing, walks on the beach and bike riding. Lo and behold - I was the only one who did not know how to ride a Bike. I felt lonely and left out as my friends took long rides along the beach, and I lay on the sand and read a book. I took a vow that I had to learn how to ride. Fast forward 20 years later and Susan has made my dream come true with barely 5 lessons. Susan is the most patient and calm teacher I have ever had in all the things that have been taught to me over the years. It's a joy to learn with her. 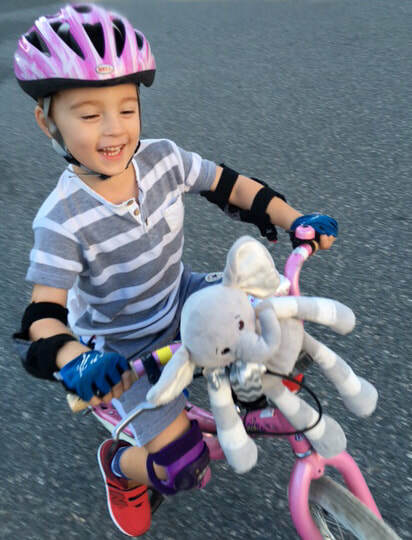 Thank you so very much for your patience, caring, persistence, support and knowledge to help Griffin learn to ride. Without you, we truly believe that he would not have learned. Despite his special needs or maybe because you knew it would be a challenge, you agreed to teach him and gave him the confidence to learn. The look on his face when he is riding the bike is priceless. He is so proud of himself and we are proud of him. Thank you again so very much for helping Griffin achieve this important milestone in his life. As dreams go, mine was learning how to ride a bicycle. For years, I watched children and adults ride effortlessly, and envied them dearly for their ability... Then I met a wonderful man who made my wish a reality. On my 46th birthday, he, my youngest son and I traveled from Dallas to Boston to meet Susan, the coach, friend and angel who unlocked the key to a world I never knew existed. I was scared out of my mind, with butterflies roaming in my stomach, and muscles tight enough to lift a van. Susan, with her positive attitude and infinite patience gently guided me through my first ever experience of gliding on a bicycle. It has been almost a month since my maiden ride in Boston, and whenever I ride, I feel God's gentle breath bristling through the trees. You too can make your wish come true, and make bicycle riding a reality. I thought it would take me forever to ride a bike, but within an hour of meeting Susan, I was biking away! Having finished the course yesterday after four sessions, I feel confident on bike paths and look forward to continuing after I get my own bike. Susan is patient and encouraging and an overall great instructor. I would recommend her class to anyone who doesn't know how to bike. It's so great to be able to bike now since my husband is an avid biker and it will become a shared hobby for us. All thanks to Susan! I just completed Susan's four-class course for beginners. I must say, if you dream to ride a bike but are afraid to do that, take these classes. She is a great and passionate teacher and makes the impossible happen so easily that you won't even notice that you are starting to ride a bike! And the pleasure of riding a bike and excitement you feel is unbelievable. Susan took us gradually from zero skills to the ability to ride on the bike path, circling, avoiding the pedestrians, and all along the way giving us information about the rules and some tricks. I'm very grateful for the existence of a such a school and the opportunity to take these lessons. I found it on the Internet and am very happy that I decided to "go for it." I never learned biking when I was a kid.. I had a tricycle but instead of riding it I used to pull it on two rear wheels and sell ice cream. Then I got busy with my studies and stuff and I grew up. I used to think I had missed the window where you can learn how to ride a bike and I kind of gave up on it. Here in Boston whenever I saw a biker I used to sigh in longing and wonder if I would ever be able to do it, well until I found Susan. So I was at work and I was thinking being in US has its perks and that I was able to do whatever I wanted to. How come I cannot learn biking? That question led me to Google search and I found this Bicycle Riding School in Somerville, MA. In the beginning I wasn’t so sure if I could or should do it. I found the school in November and I didn’t contact Susan until May, so yeah you can imagine how unsure I was. But then one day I closed my eyes and took a deeeep breath and sent an email to Susan for signing up… and wow she replied to me promptly. Let me tell you that was the most rare thing I have ever done and I am soooooo glad that I did it. My sister and I never made it beyond training wheels as kids, so we were apprehensive (and embarrassed) about learning to bike as adults. 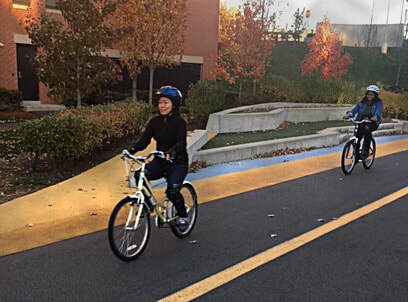 When we saw Susan's biking school website, we decided it was time to learn and enrolled in the adult intensive class. 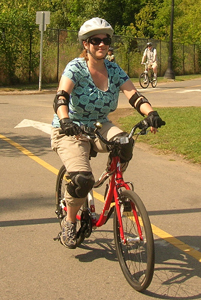 Susan is a brilliant instructor and very passionate about teaching people how to bike. She was able to understand each one of us and streamline the class to cater to the needs of the individual student. What we thought of as a seemingly impossible task was simplified and both of us can now bike after just 4 classes! Learning how to bike from Susan has definitely been an experience we both will never forget! Wow..! Susan, how could you make this look so easy? Learning how to bike was something I was dragging my feet on for almost 30 years and you made it happen in seven hours… I still cannot believe that I actually can ride. Thanks for all your positive energy, huge smile and endless patience. I will be remembering you every time I hit the road on my bike. Hope to see you again..! 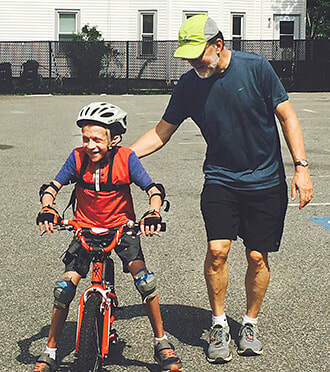 Cheers, Bozkurt "Bozzy"
Giani and I had the most fun ever during our bike lessons with you and I could not have had a better companion to learn with than my daughter. This was a mother/daughter experience that we will treasure and enjoy together for a long time. We appreciate your time and patience. THANKS to you, both Giani and I can ride bikes. In 2012, I received the best Mother's Day present a woman could ask for. My husband (at my urging) got me bike riding lessons with Susan McLucas of the Bicycle Riding School. 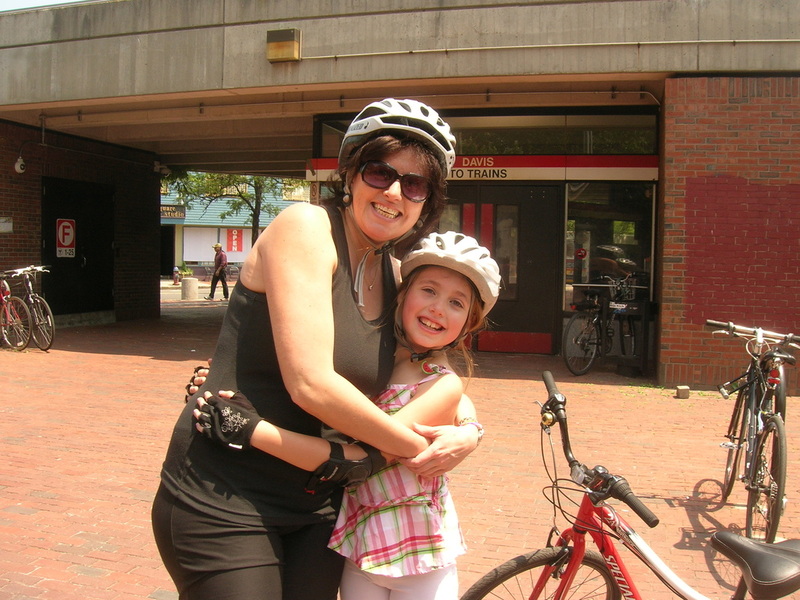 I was approaching forty and my older daughter was approaching the age when many children learn to ride a bike. I had never learned to ride and decided the time had come to learn. Susan's calm manner, compassion, belief in my ability, and confidence in her technique instantly erased my embarrassment and feelings of inadequacy. And she soon erased my status as a non-bike rider, too! I am in awe of Susan and will be forever grateful for the world she opened up for me. Before taking your lessons, I couldn't even get on a bike! But after one of your lessons, I was getting the hang of it, and now I know how to ride a bike! Thank you very much! Thanks for all your help. I love how you remain calm and never give up on teaching anyone. I had a Bicycle Bash! I don't know if you remember me. You taught me how to ride a bike in July 2012, along with a woman named Rebecca from New Mexico. I just wanted to write you to thank you for your guidance. As you may recall, I moved to Japan shortly after the lesson, and I am still working here today. I bike to work every day, and it is by far the cheapest and most convenient way to get around the city that I live in. I have made multiple attempts to learn how to ride a bike throughout my life and most of them ended in failure, so I sort of assumed that it was never going to happen, but thanks to your help I finally got it. Just wanted to say thanks again for all you did. Just wanted to let you know that I did eventually graduate from the parking lot and am now enjoying my bicycle, actually much more than I ever thought I would. Thank you so much for getting me started and helping me develop the courage to persist. I can’t believe I am not going to see you this Sunday! I am going to miss you…and I am not kidding! Thank you for your patience, support, tact and everything you offered so generously! It takes a big heart to do what you’re doing! If you had told me last year that there was still a chance I could get on a bike…and ride it, I would have been convinced you were making fun of me. 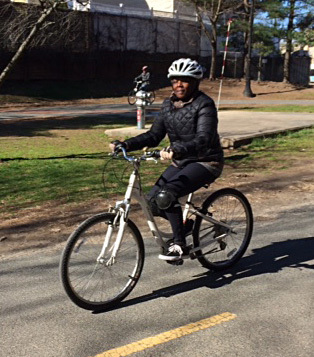 I really enjoyed our classes and experiencing biking for the fist time. I so much needed to learn for myself that “it’s never to late”! Thank so much for the pictures and the lessons!!! We had such wonderful lessons and time with you. It was such a great and positive experience for me and Anya. Well, I have to report that I already got bikes and helmets for both of us, and we can't wait for a good weather here to go biking. I've told all my friends about your biking school - never know, maybe some of them will call you. Thank you, thank you, thank you for having your school. I am so glad I finally did it for myself and my daughter! I want to thank you again for working with Jillian. We got home Saturday, and Sunday, after putting air in all of our tires, adjusting Jillian's seat, we went for a bike ride. Oh yes, Jillian insisted on putting ducktape around her pedals like your bike. At first, she said it was different than the one she learned on and was a bit timid, but once she practiced, she was off. We have been trying to teach Jillian how to ride a bike since the first grade. She is now in 6th grade. She did great with training wheels, but once she got too big for training wheels, she became afraid of falling. Besides her dad trying to teach her, there were others who tried. There was a personal trainer at the health club who said she could teach her....not!!! There was a friend of ours who said he could teach her.....not!! Each time Jillian would freeze up and her fear would get in the way. We tried the park, the grass, removing the pedals, a new bike, a peer to come and ride with her and nothing worked. About a year ago, a friend from Boston sent me an article about the Bicycle Riding School in Boston. I emailed Susan and we have been emailing back and forth all year. I finally decided to go to Boston, visit my friend, take Jillian, and set up lessons with Susan from Monday to Friday. I told Jillian that if she did well in the mornings riding, we would sightsee the rest of the day. And that is what we did. To our amazement, she rode the first day. She was on the bike path by day 3, and graduated on Day 4. She did not even need Friday. For years, I have been attempting to learn how to ride a bike. I tried learning on my own, but that was not fruitful. I was always afraid to give it a go. A couple of relatives attempted to teach me, but they just laughed and thought it was hilarious that I couldn’t do it. Discouragement piled up and overtook my desire to learn. As I approached age 50, I figured it was time to go through my bucket list. You know, the things I want to do before I kick the bucket. Bicycling is one of them. So, I got me a decent bike, read through the self-learning ideas and watched a couple of videos and tried again on my own. I had the determination but couldn’t find a place to do it where I could be confident and do it in private. I found someone local through the bike league website who attempted to teach me, but he didn’t have the right experience and personality. Plus he took me to a busy street where people were looking while I struggled with the balance. Discouragement set in again. So, it was time to search for someone who specializes in teaching adults to ride. I found the Bicycle Riding School website and e-mailed Susan right away. She was quick in responding and we sealed the deal! I traveled from Florida to Mass and even stayed at Susan’s. Not only was she a great teacher, but also a great host! Each lesson, I made progress. My determination matched Susan’s teaching techniques. She was a great cheerleader, each time I made some progress, she cheered on! As my last final two lessons came and realizing I would be leaving the following day, I felt I just gotta do this. So, came the first pedal, and the next, and the rest was history! I was pedaling and turning with confidence! Well, following a straight path was still a challenge by my last lesson, but I know I can practice that on my own now. The hard part is over! This is not just bike-riding; this is a change in lifestyle for me and the many people you’ve taught. Thanks again, Susan! A step forward, pedal by pedal, both exhilarating and challenging, gaining confidence and skill while opening up new opportunities to have fun with my family and friends. A great class with no pressure. You can feel at ease with other students. I was comfortable because she was always near me. It was fun because I learned new things every time. The day I found the Bicycle Riding School and Susan McLucas marks a turning point in my life: At 60, I finally found a safe way to learn to ride a bike. I was making plans to go to Somerville from Pembroke Pines, Florida, when Susan suggested that, in the interim, I try her Method outlined on the Website. The Method is very detailed, easy to follow and even indicates the difference between the different types of bicycles. Susan even kept in touch with me via e-mail to monitor my progress. And, if you can just virtually hear Susan’s words of encouragement and have a good friend to cheer you on: “pedal, pedal, pedal... Great !!! “ you suddenly feel like a million $ baby with wings at your feet! Thank you, Susan, for making a difference in the life of so many boomers. After I finally came out of the closet about being cyclically challenged, I had about half a dozen friends offer to teach me. Maybe more. But if you're reading this, you know how uncomfortable that is. I had been looking for a class like this for years, and everyone I asked laughed, thinking I was joking. Long story short, this class is amazing. No embarrassment factor, and zero pressure. Imagine the most comfortable possible learning environment, multiply it by 10, and you're almost there. Everyone was riding by the second class, and after the 4th, I rode my bike home! I fell down from a bike when I was learning as a child, and didn't try since then until 4 years ago that I bought a bike. The bike I was offered had a seat that at the lowest position was so that even the tips of my toes could not touch the ground. I had been looking for biking classes during those years until a few weeks ago when I tried a group class; I was surprised when the instructors tried to make the seat even higher. I had a very bad experience in that class; not only I had a fear of falling but also, the instructors would put you down in front of everybody. I was very lucky when I found the Riding School at Somerville. Susan, my instructor, is simply awesome as a teacher. She is very patient, calm and encouraging and also transmits the feeling that biking will become as a second nature in no time. The learning atmosphere is very soothing. At the first lesson I was biking at the bike path near the school with one of the school's bikes, I did not fall down and I wasn't scared. For the second lesson I brought my bike. when Susan saw my bike she brought up the issue of the seat's height and advised me to take it to a store and have the post changed-I had it changed at a store after bitter comments from the service guy who said the problem was not the seat's height but my fear of falling down-I graduated on that second lesson and to my surprise I got a diploma, which I am very proud of. After my graduation I went by myself to a bike path and I felt something I had forgotten, the pleasure and freedom that biking gives. I am very happy I have conquered my fears. Thanks, Bicycle Riding School. I thoroughly enjoyed your bike class. You are a wonderful and patient teacher. You made me feel relaxed and confident, which was no easy feat considering the years of shame and baggage I arrived with. I'm so glad that I took your class and can now look forward to years of biking. 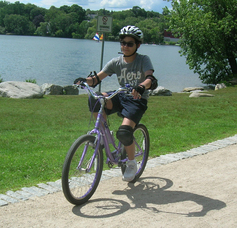 In our last class, as we biked to the pond for our pinic, I felt as if I was flying. It was so amazingly liberating to be biking along the path with the wind in my face. Now I know why so many people bike - because it's fun! Thank you so much for offering this class and for nuturing such a warm and encouraging atmosphere. How comforting to find out I wasn't the only person over the age of ten who never learned to ride! What's amazing is that we went from struggling to sit upright on our seats to taking an hour long trip down a bike path, all in the space of three or four classes. 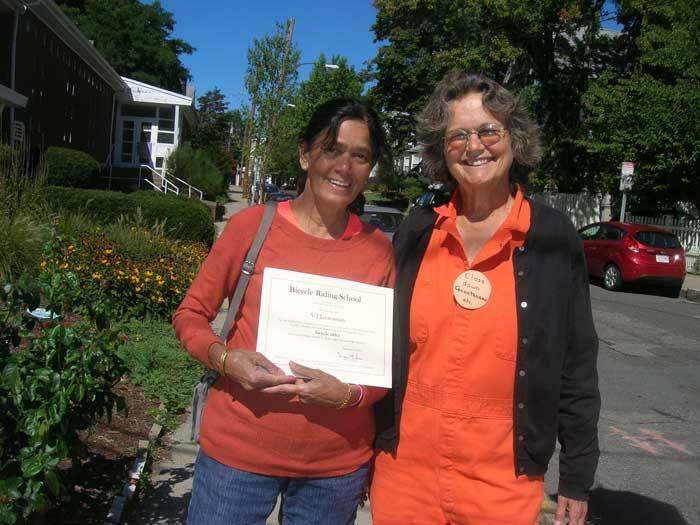 Susan's easygoing teaching style put me at ease and made the whole process less intimidating. She made sure everyone got the individual attention they needed, from adjusting the bike to the right height to working in extra practice time. Despite how quickly everyone picked up the basics, it was a calm, relaxed environment to learn in. I'd recommend any beginner to roll up their pant cuffs and take this class. I was convinced that learning how to ride a bike would be an ordeal, but wasn't I surprised to be riding before the end of my first lesson! Susan is incredibly patient and encouraging, and her method doesn't teach you how to ride a bike so much as give you the confidence to believe you can do it all by yourself. Taking lessons with Susan was a great experience; I wholly recommend it. It's never too late to learn how to ride! My 8 year old daughter Chelsea was afraid to ride a bicycle and no matter what my husband and I tried, we could not teach her to ride. Most of her friends had been riding bicycles for a couple of years and it was getting difficult for her to keep up with them as she still had training wheels on her bike. 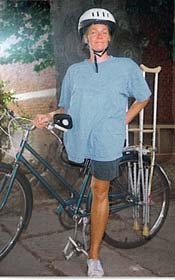 I searched the internet and found Susan's website for her Bicycle Riding School and thought it was worth a try. Chelsea went to her first class with Susan and actually coasted on her bike at her very first lesson. This was a huge step as we couldn't get her to move more than an inch on her bike when we were trying to teach her previously. By the end of her second lesson, she was riding the bike! We could not believe how fast she learned and how confident and happy she was riding her bike........she had her third (and last lesson) and never looked back! Susan is an amazing teacher........she was extremely patient and she let Chelsea go at her own pace, which really helped. She led Chelsea slowly and carefully through all the steps of riding and there were a couple of little things that Susan did, for example removing the pedals from the bike, that really made a difference. Chelsea started out very fearful of riding and a few weeks later I'm happy to say she actually made this comment to me: "Mom, I don't know what I was so afraid of.....this is easy!" I can't thank Susan enough for her gentle, patient instruction.......she's a wonderful teacher! 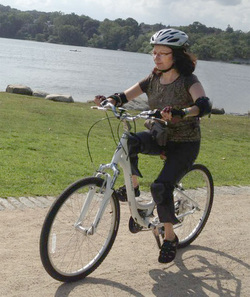 I am a 58 year old woman from NY and have been wanting to ride a bike for many years but never acted upon it. A few weeks ago, I decided it was time!!! I went to a bicycle shop in my town and asked them if anyone who works there would teach me. To my disappointment no one was willing to! Internet to the rescue - I googled, and Susan McLucas and her bicycle riding school came up and was I excited ! I registered for a weekend session and at the end of the weekend I was riding on a bicycle trail ! No Kidding. I came home and bought a beautiful red bicycle and have been riding it often. Susan is a fantastic teacher - gentle, motivating and very persuasive. Her method of teaching adults to ride a bike is amazing. No falls, no injuries and not in the least frustrating... It is exhilarating to be able to bike... I would unequivocally encourage each one of you that wants to learn to give Susan a call. It is never too late. I always enjoy attending spin class at a local gym. If you saw me ride during the class, you would never believe that I didn’t know how to ride a bike. But at the age of 42, fear was overcoming my desire to learn to ride a bike. When I saw Susan on TV, I got excited and checked her website right away. I scheduled a weekend trip to Massachusetts with my husband (for support) and in the morning of my first class I had butterflies in my stomach and I was hoping it would rain so that the class would be canceled. It didn’t, and it turned out to be a great day. With Susan’s encouragement and patience I learned to ride a bike. Her method works and my fear was replaced with confidence. It was a fun class and very positive. It really feels great to learn and I'm excited to continue learning and enjoying the outdoors. Thank you, Susan, for making it possible. Chitra (originally from India) came from New York and Mila (originally from the Philippines) came from Minnesota for an intensive weekend of lessons. This is their graduation class. Yesterday (Elsa and Huw) rode for about five miles, their longest journey by bike thus far. They want to ride every day--learning how has opened up the world for them and given them a greater sense of their own power and courage. Thank you for the lifelong gift of this skill and all that it brings with it. With great happiness--and gratitude from us all. 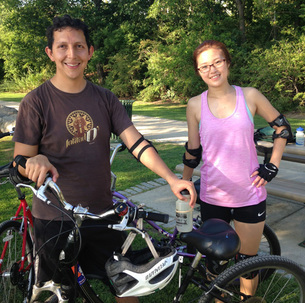 Before I took bike riding lessons with Susan, I felt clumsy and never thought I'd be able to learn how to ride. I used to be embarrassed that I was 12 years old and didn't know how to ride a bike. Many of my friends rode bikes and I always felt bad that I couldn't ride with them. But during the first lesson, I was astounded by Susan’s great methods. Even though I was nervous at first, she showed me there was nothing to be afraid of and gave me the confidence to try. It was amazing to me that I was able to ride and keep my balance independently on my first lesson! Since last seeing Susan (after celebrating my graduation with a ride from Davis Square to Spy Pond with Pata), I have gotten my own bike and have ridden it on the bike path and to my friend's house. Thank you, Susan, so much for helping me learn that I could ride a bike! You really are the "bicycle whisperer!" One of our students learned to ride with one leg. 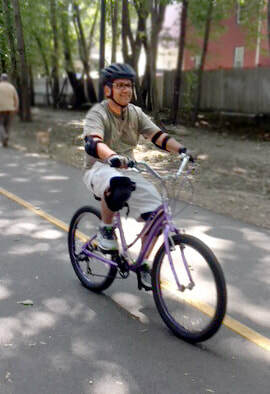 We modified her bicycle by removing the extra pedal, adding weight to the pedal so the toe clip faced up, and making a way to carry crutches.